A new cold storage warehouse is being designed and engineered for a seafood exporter. The cold storage warehouse will have a cooling duty of 300 kW(average) to chill and maintain produce at -10oC. Install a single refrigeration unit with an 85% expected efficiency of converting grid power to actual cooling duty and size the refrigeration unit at 125% of average duty ie. 440kW. Install a single refrigeration unit with an 85% expected efficiency of converting grid power to actual cooling duty and size the refrigeration unit at 200% of average duty ie. 706kW. Also install a suitable quantity of encapsulated PC-10 with a passive cooling duty (at around -5oC) of 300kW for 12 hours (per day). How much PC-10 to absorb 300kW of power for 12 hours? 300 kW = 300 kJ/sec = 12,960,000 kJ per 12 hours. 12,960,000/310 = 42 tonnes of PC-10 required. 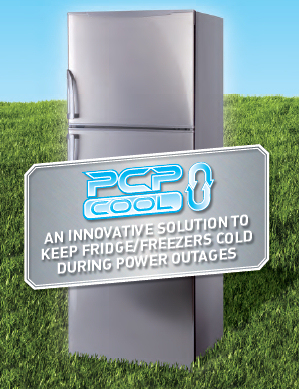 The gross operating savings in power cost is ~ A$155,000 per annum by adopting the PCM Option 2. A determination/judgement then needs to be made whether the additional capital cost of the PCM Option 2 is acceptable in return for the operating savings.